You'd be hard pressed to find a prettier setting for a capital city than Stockholm, Sweden. ...And seafaring is certainly in the Swedish blood. 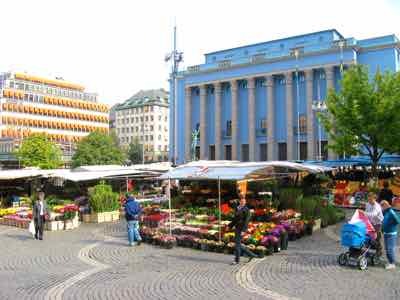 But you only need to visit three or four of them to get a real feeling for this Nordic capital. 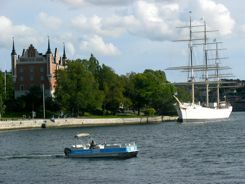 The sea that Stockholm sits next to is the Baltic, but it is actually built on Lake Malaren which flows into the Baltic. Norrmalm is the downtown area. The train from the airport arrives here, so this is probably the area where you'll start. The bus depot is in the same building. You'll find lots of hotels and shopping on this island. It's a convenient place to stay, and it's within walking distance to Gamla Stan. Don't ignore it though. Wander around here too. Find the flower market. See the Concert Hall. 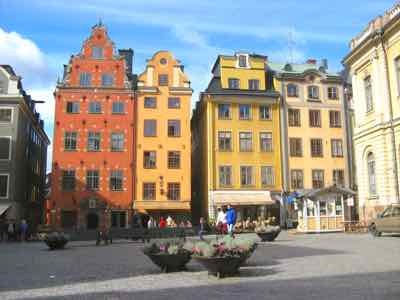 Gamla Stan is the Old Town. It's a colorful, well preserved tangle of winding, cobble-stoned streets lined with restaurants, antique stores and tourist shops. It's anchored by the Royal Palace. You'll spend much of your time just wandering here. You can watch the Changing of the Guard at the Royal Palace at noon. Tour the Palace itself. You'll find street performers or you may stumble on a school band concert like we did in the small square in front of the Nobel Museum. There are several museums here. There is also an open air folk museum, and an amusement park. 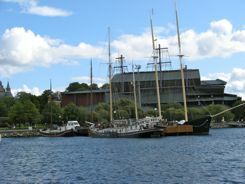 The first place you want to head is the Vasamuseet, The Vasa Museum. The Vasa is a well preserved 17th century Swedish warship. She is really beautiful to behold, but she was a sailor's nightmare.... having sunk 20 minutes into her maiden voyage. with several museums, an open air folk museum, and an amusement park. It was probably because she she sank in those shallow, cold and brackish waters that she survived to be raised and put in this museum for us to marvel at. The inside of the Vasa Museum is a photographers nightmare I might add. It is dark in the museum, so we really didn't get any good photos. Sorry for us and for you. How about a photo of the outside of the museum... from the hop-on-hop-off boat... that's the best way to get there. Around the corner from the Vasa is an exhibit building that houses old boats including one used by the King for Royal weddings and greeting dignitaries. Also on this island is Skansen, Europe's first open-air folk museum. Today, around 150 traditional and historic houses and buildings have been moved here from all over Sweden. If you have time, you could visit the Nordic Museum to learn about Swedish cultural history. And for the child in you, you could visit the Tivoli Grona Lund amusement park. Skeppsholmen is a small island stuck in the middle of these three. It's a traffic-free park with trails and the Museum of Modern Art. If you just want to take a walk in the park... right in the city... this island is for you. The hop-on-hop-off boats stop here. You can arrive by cruise ship right into the heart of the city. If you fly in, you will arrive at Arlanda Airport. The fastest way to get into the city is the Arlanda Express train. It's a little expensive, but you can get a two-for-one price on weekends. It effectively whisks you into town in 20 minutes. The Flygbussarna, the airport bus, is half as much, but it takes longer with traffic. Airport shuttles are another alternative that will get you right to your hotel if you're staying in Gamla Stan or away from the central train/bus station. The Tourist Office at any point of entry will give you lots of information on where to stay, how to get into town and how to get around. They're very helpful. Stockholm is a city that invites wandering on foot or getting around on the water with the hop-on-hop-off sightseeing boats. You really should see it from both perspectives... land and sea... because it's such a beautiful combination of both.